coconut rhubarb icy pole / ice pop / popsicle. In Australia we are lucky to have rhubarb available almost all year round. While I feel I should really have produced an ice cream recipe for summer, it's never too late, especially since it's still only mid-autumn, wouldn't you agree? For those of you on the other side of the world, I believe rhubarb is in season now that it's spring, so I hope this works out to be a timely post for all. Plonk the rhubarb, sugar and citrus juice (if using) in a saucepan. Cook over a medium high heat until it starts to bubble, then turn the heat down to let it simmer, partially covered, until soft, between 5 - 10 minutes. Blend the rhubarb mixture together with coconut milk and water together until smooth. Do a taste test and add more sugar if desired - give it another thorough blend if doing so. 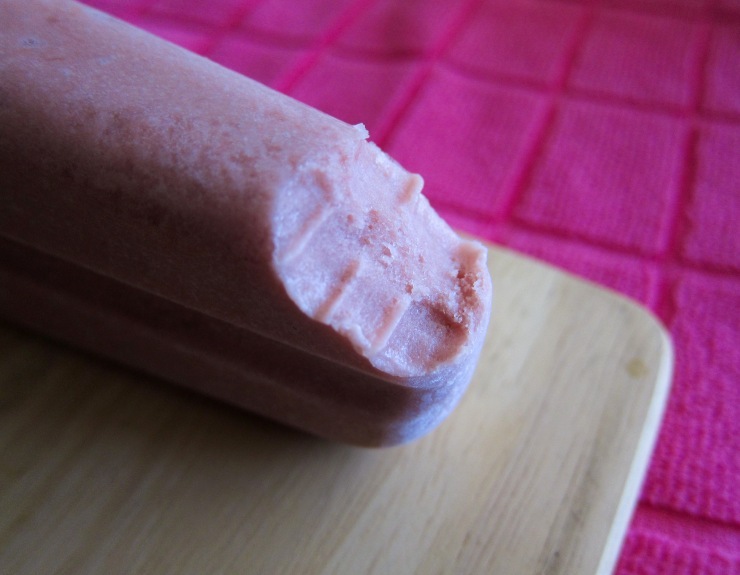 Pour the rhubarb ice cream batter into ice pop molds. 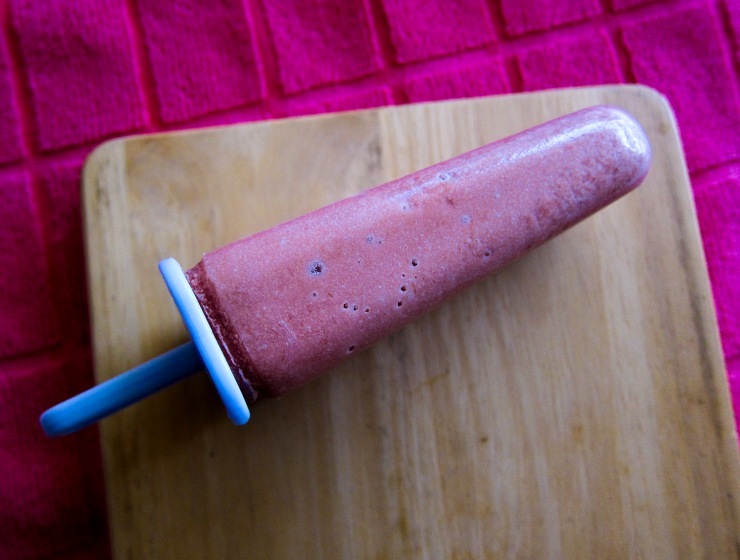 coconut rhubarb popsicle. i took a bite! and finished the whole thing after taking the photo, of course. That sounds lovely! And what a beautiful colour. Love the tart/mellow flavor mashup here. Just right. Ha yes! We're pretty lucky over here for things like that. It snowed here again yesterday. A part of me doesn't believe it will ever be warm ice-pop weather here, ever ever. Nom. My Mum always used to make stewed rhubarb and rice pudding. Your pops look awesome. I found yellow rhubarb the other day. So yum! Yeah I quite like using coconut milk or coconut cream in frozen treats. And I always enjoy a bit of tart rhubarb too! Sounds and looks lovely.. makes me shiver in this cold though! 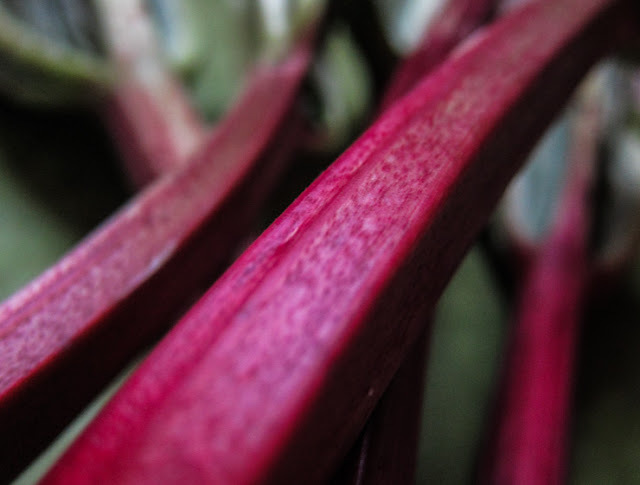 Such vibrant stalks, I just love rhubarb season! 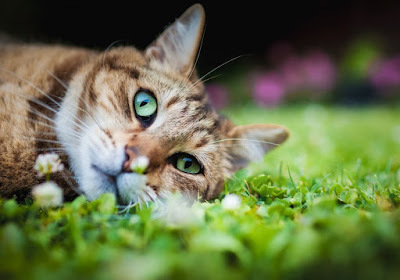 Yes, I love the vibrant colours! These sound dreamy and look so pretty. I am happy to eat icecream all year round! Me too! I can even enjoy ice cream in winter, as long as I'm well-insulated and it is a rich, comforting flavour. Yum. yum yum yum!! I love ice cream in winter as well. Thanks, tori! The rhubarb-coconut combination is indeed quite lovely. I love rhubarb and have heaps growing in my garden, so this is a great dish for me. Yummo! Oh, lucky you! Endless rhubarb!